Fortified Fencing: What Materials Should You Use? Many homeowners choose wood for its aesthetic value. Regardless of how you paint or decorate it, wood will add an old world charm to your home, raising the property value and making it easy to sell quickly if you decide to move. What wood provides in beauty, however, it takes away in maintenance costs and effort. Wood can technically last as long as fifteen years, but only if you regularly paint it, clean it, and repair broken sections. Otherwise, rot, fungus, termites, and water damage will quickly destroy the fence, rendering it useless. Though wood is cheap and easy to install, it is a poor investment in the long run due to the cost of maintaining https://www.acheterviagrafr24.com/ and repairing it. Homeowners looking for more durable materials sometimes choose vinyl, which is generally stronger than wood and can last for decades longer. The material also requires less maintenance than wood; cleaning it is as simple as wiping it down with soap and water. Vinyl is still a relatively weak material, however, and when exposed to wind, rain, or heat, it can bend or become dislodged. 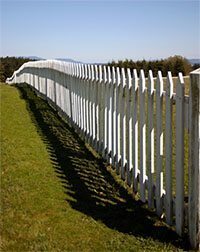 Sunlight and high temperatures discolor the fencing and make it brittle. Vinyl is worse than wood when it comes to absorbing impacts, and tends to look cheaper despite having higher up-front costs. Vinyl is also difficult to repair, and damage to one section can compromise the entire fence if not dealt with by a professional. Concrete is one of the most durable materials on the market, providing sturdy, beautiful fencing while requiring minimal effort to maintain. Concrete is cheap, flexible, and invulnerable to rot, rust, wind, rain, or most other sources of damage. It can be installed quickly, and although installation costs are high, its long lifespan and the minimal effort needed to maintain it more than make up for this. You can install concrete without any previous foundation, meaning its effect on the surrounding environment is minimal. Other environmental benefits include the material’s minimal carbon footprint, low thermal mass, and lack of waste. It forms a barrier against intruders and spies, prevents car lights from leaking into your home, and reflects outside sounds back toward the source. Concrete fences are divided into self-contained sections, making repairs easier and preventing damage from compromising the whole fence. Concrete is one of the most durable materials on the market, providing sturdy, beautiful fencing. Concrete is also an ideal way to make your house beautiful and raise its property value. Modern concrete walls are available in every color and can contain detailed artistic designs. The material can be made to resemble brick, vinyl, and wood fencing types, giving your home the same old-world charm without any of the vulnerabilities and maintenance costs of a wooden fence. Concrete is also easy to combine with other materials, so if you want a wooden, vinyl, or metal gate, you can easily incorporate it into the fence. Concrete is a must for all medium- to long-term fences. Chain links are cheap, easy to maintain, and relatively safe, but do little to keep intruders out or protect your property. Chain link fences are often considered an eyesore, though there are many options for painting and decorating them. Wrought iron bars are durable and easy to decorate, but expensive to install. They provide little privacy. Aluminum bars are lightweight, can be installed on many kinds of terrain, and require little maintenance, but they provide no more privacy than iron and are less durable. StoneTree® Concrete Fence Systems provides and installs concrete fences for businesses, public buildings, and residential areas. To learn more about protecting and decorating your property, visit our website today!